How fuzzy peaches are made. Where has the best Taiwanese Beef Noodles? The food scene in the interior. The bajillion meal prep services. When Uber will start in Vancouver? Imagine this. You are inside a large coffee roaster’s production site, in the rural areas of Richmond. Snug tight on your head is a blue hair net and an oversized lab coat is draped on you. To your right is a gargantuan machinery you’ve probably only seen in documentaries about factories and production facilities. To the left, you see Canterbury Coffee’s Assistant Manager and Q Grader Tim Cole yelling through the deafening humming of the roasting machines. He flips on a switch and a wave of shiny dark brown coffee beans pour into a large metal cooling centre. As the large beams begin rotate in the cooling device, Tim explains to you what’s about to happen. Like many Vancouverites, I don’t usually get to see what goes in an award-winning restaurant’s kitchen (or a tiny food truck) or a gigantic production facility or really be connected to the great chefs in the city. The fascinating part of each volume is not only being at those special areas, but being able to shed some light about them so you learn how exciting our city’s food scene really is. One theme that keeps coming up again and again when I interview chefs or foodies is on curiosity. What drove them to start what they do today was because of their intense desire to know more. For instance, in our chat with Chef Felix Zhou of Heritage Asian Eatery, his thirst to know more about the food he was eating as a child led him to be closer to food. It didn’t hit me until a few years ago - this curiosity about food. And I think as we grow older, we do gain this interest in food. When you’re in high school or university, your intrigue is quite limited due to financial barriers. I surely put a lot of junk in my body during those years. But as I make sense of budgets, become unshackled from student mindset and appreciate a glass of wine - I can’t help but want to try new dishes or inquire how things are made. Maybe that’s just me. I do hope others feel the same though since there are just so many golden nuggets that this city has to offer. And with each volume, I’ll make sure we uncover those golden nuggets. It would be a shame not to. In just one year, the Frying Pan became one of Vancouver’s top food trucks. Their long lines, rabid fanbase, and glowing reviews are proof of that. But where did they come from? How did they take the city by storm? We chat with owner and main chef Jacob Jung and consulting chef Deuce Kim to learn how the Frying Pan started, the good and not so good parts of being a food truck, and more. How did the Frying Pan get started? D: Jacob was looking for restaurant spots for over a year to open his own Korean fried chicken restaurant. But he found out that he didn’t have enough start up or the places with the right kitchen. When Jacob found out that the Yolks Kitchen in Vancouver was selling their food truck, he had an eureka moment. He decided to jump on board and purchase the truck. That is how Frying Pan got started. D: So after thinking about the names and seeing what kind of names we could use, we went through a couple mistrials like Monster Chicken or something more masculine, One day, he and his wife were walking around a food equipment store and saw this little small frying pan. They felt that it was a good name. It felt homey. So they decided to go with that instead of a more masculine brand. It felt more homey and more appealing to the masses. Out of all the food in the world, why fried chicken? D: I don’t know if you’ve ever been to Korea or had Korean styled fried chicken...We believe it is one best in the world when it comes to crispiness and flavour. We feel the technique in Korea is bar none to other fried chickens - even buttermilk chicken or other fried chicken that is really popular in America. In having that Korean pride and pride in being able to make good chicken, Jacob wanted to infuse what’s popular in Western culture like in the States with Nashville hot style chicken and integrate it with Korean fried chicken. That way he can have his own menu and appeal to the masses when it comes to chicken. What are some advantages and disadvantages of being a food truck? D: During the summer it gets way too hot in the kitchen. During the winter, it is way too cold. There’s never a middle ground. Also having all the equipment on the truck and moving constantly is not very good for the truck or equipment. So the equipment has a shorter lifespan compared to in a restaurant. Also the fact that our customers have to eat on the street. They don’t have a place to eat or have to bring it back to their office or homes. This is a disadvantage because I feel that our food is super high-quality and we want them to enjoy it in the best state - which is right away. Because we are a truck and we can’t provide that those kind of settings, it disappoints us. But great thing about food truck is when a customer gets their food - and even without us noticing - there may be a bunch of people passing by looking at our food. That is an instant feedback and instant gratification that our food looks good or they can ask if it is any good. Because of that, people tend to line up by just looking at our food and how the food is presented. I think that is one of our greatest assets. D: We’re really thankful for all the attention we’ve been getting as a food truck. Its been only about a year since we’ve opened and we think that the positive feedback we’ve gotten from the locals is unbelievable and we’re truly so thankful for that. There’s a notion that food trucks: you’re not getting the high end quality proteins or they’re not using the highest quality ingredients in order to make the ends meet. We decided to not think about that. Instead of serving 100 low quality food, that’s not memorable to people, we rather spend a little more money on our ingredients and serve 30 people and they have a more memorable meals from a food truck. If we can do that and do it successfully, we can do it for all of the city of Vancouver. We feel like we have a system where we can be quick but also bring out the highest quality we feel we’re proud of instead of not knowing the source of where our ingredients come from. We know where our chicken comes from. We know where we get our bread. Those little details are what people are starting to notice. I think people are starting to notice the quality of our chicken and our bread. Everything is made in house and no short cut is taken. So when it comes to food, I think people are starting to realize that. 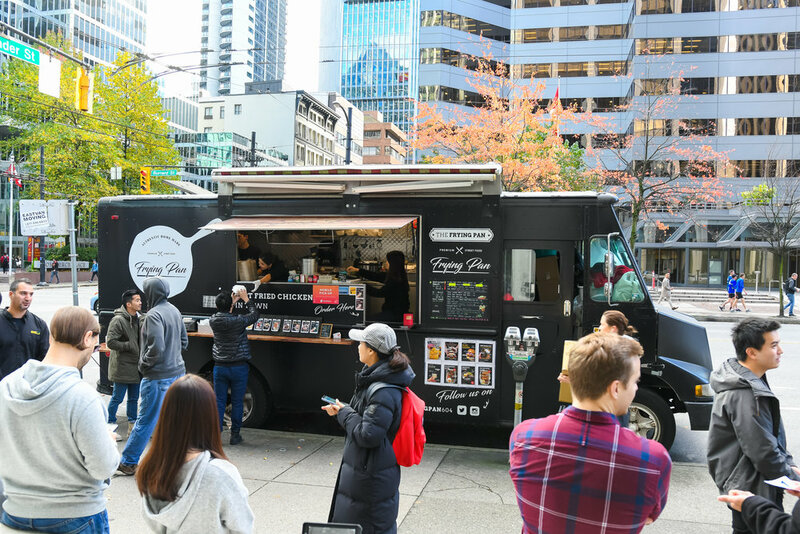 We want to bring that type of quality not just to our truck, but we want to set a standard of that quality for all the food trucks in Vancouver. D: For us our next step comes from our first goal in opening our own spot. Being a food truck, we have a lot of limitations on what we can do. Things like hours, what we can serve, limited storage so we can’t be packing a full menu. So we want to be able to showcase our cooking skills in a solid spot, where we are continually growing as a fried chicken place. But also serve new items, new menu that is something more innovative and appealing to the masses. Hopefully something we would get a positive feedback on. We’re constantly working. Constantly thinking about our menu and how we can improve our quality and the food truck. So we’re really hoping that around next year we’ll be having a restaurant and operating both the food truck and restaurant. Coffee is one the most consumed liquids in North America. It is also an important part of our daily rituals. But like wine, people often feel intimidated by its complexity. And with the rise of the specialty coffee and hipster cafe scene in Vancouver, having a basic understanding of the craft and what suits our tastebuds will be more important. Coffee is grown at various elevations and countries around the world. Mostly in countries that are near the equator for a more consistent climate and longer growing period. Once the cherries has ripened into a full red berry, the farmers will begin picking it. Different elevations will ripen at different times. Lower elevation will ripen quicker because of the warmer temperatures being closer to the ground. Natural Process: beans are dried on patios with the cherry still on it. Allows for more fruity flavour. Washed Process: beans are put in a water bath to separate the different densities. The most consistent ones are taken. Allows for a more consistent roast. Transforming the raw green bean to the dark brown bean you regularly see in coffee shops. Heat penetrates the bean and forces the internal sugars to the outside and changes its colour. Coffee Cupping is regularly done by Q Graders to evaluate flavour and consistency of a roast. Various cafes and roasters hold cupping sessions to allow the public to taste various roasts and learn more about specialty coffee. Winter is almost here and we know what that means: Busy days, busy nights, and ZERO time for healthy eating. We get it, when you’re on the go the last thing you want is to use the little time you have to make a good meal. Cue, MELU Juice & Health Bar and their on-the-go solution for healthy living and good eating. MELU has a lot of healthy lunch ideas to keep you from falling off the wagon during the winter season. In our interview with them, we go through all their yummy offerings – like their cold pressed juices and superfood smoothies that are to die for. With their wide selection of foods, you’ll know how to stay healthy during the cold season – and enjoy your meals while you’re at it. Can you first tell us who you are and about MELU? A: My name is Angela, the owner and founder of MELU Juice and Health Bar. MELU is a quick service healthy cafe that serves cold pressed juices, superfood smoothies, acai bowls, avocado toasts, salads, and sugar free, vegan, and gluten-free raw desserts. It’s easy to forget about eating properly or healthy when things get so busy. How can MELU help with this? A: MELU was founded on the premises that we all need to nourish our bodies with sufficient nutrients, and a large variety of fruits and vegetables regardless how busy life gets. MELU hence creates wholesome and delicious recipes that allow people to consume the nutrients they need without sacrificing time or taste. In each of MELU’s 500ml jar of cold pressed juice, there are about 2 to 3 lbs of pure fruits and vegetables without ice, water, or sugar. Can you tell us more about the ingredients and how the juices are made? How does it keep someone healthy? A: MELU’s cold pressed juices are creative in a way that some of them are made of unique ingredients that you don’t usually consume. The juices are made with a cold pressed machine. It has been proven that heat and oxidation promote denaturation of the vital enzymes and nutrients in fresh produce. This is the result from using a rotary blade regular/centrifuge juicer. Cold pressed, on the other hand, slowly and thoroughly extracts juices from fresh fruits and vegetables with absolutely no heat and minimal exposure to oxygen using 6 tons of press weight, thereby preserving all the health-giving properties, live enzymes, vitamins, minerals, phytochemicals, and other vital nutrients. And what about the health bars? A: Our health bars are completely raw in the sense that we do not bake them , but freeze them into shape. We believe heat takes away the vital nutrients in wholesome ingredients (same concept as cold pressed juices ). So we wish to preserve as much healthy goodness as possible while making the desserts beautiful and delicious. What would you recommend a busy student or busy office worker? A: I would recommend grabbing a few green or fruit juices on the go. Because it is so hard to consume enough vegetables in our daily routine. One bowl of salad is simply not enough, and also not enough variety. As the days get colder, the streets less enticing and the holiday craze sets in, the last thing you want to do after work is go grocery shopping. Enter: the Vitamix A3500 Ascent Series Blender. Because so many restaurants and professionals use Vitamix products, they’ve got to be good. With 5 program settings for smoothies, hot soups, dips and spreads, and frozen desserts, you’ll easily be able to cook up a charm. Although you might be wondering how a blender can heat up food at the same time, it’s actually quite simple. The blades do all the work using friction, which means you’ll be getting ready for work while your Vitamix is making the soup for you. What’s more is that Vitamix blenders also work to bring out aromatic flavours and spices such as garlic and rosemary, so you can experiment with your soups too. Without being an actual chef in order to do it. Tell me something better than warm soup on a cold day. All Vitamix blenders have a self-cleaning container, where all you need to do is add a drop of dish soap and some warm water and blend for 30-60 seconds. As well as being a great blender, it’s also an exceptional time-saver. What more could a working person want? Salsa. That’s what a busy person may want. Or perhaps hummus. The speed control settings come in handy to make different things. There are so many helpful recipes on the Vitamix site, but here’s some of our own personal favourites for the Vancouver winters. There’s soup, there’s sauce, and there’s just about anything you want with one of these babies. Sautee the carrots and onions to bring out a more intense flavour in this vibrant soup. Pureed to perfection, white beans lend creaminess to. this soup, which is best enjoyed with homemade croutons. We sat down with award-winning Heritage Asian Eatery Chef and Partner Felix Zhou to learn how he started his journey as a chef, what he thinks Vancouver does well, his cooking philosophy, and more.